It was breakfast time when I arrived at Ulpotha, sleep deprived after an overnight flight and a four-hour car journey. Fifteen minutes later, after gulping down a fresh coconut water, I was doing sun salutations in the open-sided shala, a monkey watching me from the trees. Those first few hours were disorientating, tiredness compounded by tropical heat and my brain scrabbling to adjust from city-mode to remote jungle. To enter Ulpotha is to leave behind the real world and join a parallel one where all signs of modern life have vanished and nature flourishes. Spread over 22 acres of forest in central Sri Lanka, the renowned retreat operates as a self contained village – run by locals who take care of everything from the catering to the accounts to dealing with wayward wild elephants who very occasionally wander into the grounds. Immaculately swept paths wend through the palm trees and gardens, the lush green interrupted only by decorative bowls of purple, yellow and red flowers and the villagers’ saris. At the heart of the site is a huge lake – man-made 1,000 years ago and fed by spring water which, if you’re used to hard London water as I am, feels like swimming through fabric conditioner. Rocky hills rise up around the lake, providing a natural border between the village and the surrounding countryside, and harbouring small temples. 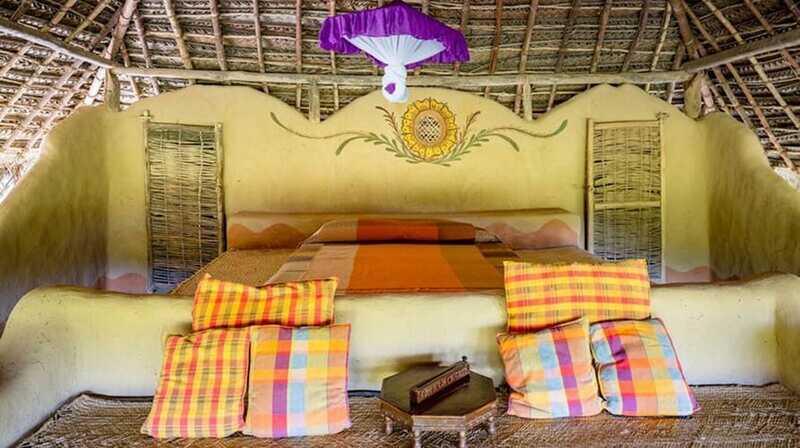 There is no electricity so no phone or laptop to tempt you to check in online; and, with no electric lights, guests soon get into the habit of waking at sunrise and going to bed as night falls. The feeling of being immersed in nature at all times is part of Ulpotha’s magic. Here you are lulled to sleep by the whirr of insects in your open-sided hut and woken by an orchestra of bird song that starts with a single note and grows as more and more birds join in to announce their presence. The yoga shala is wall-less too so you can see the wildlife – and it can see you – as you practise. After the morning class our group of 20 or so dispersed around the site, some heading for the flat raft-like hammocks strung between trees or suspended at the edge of the lake, others going for a dip. Those following an Ayurvedic programme would wander over to the centre, a collection of huts, for their consultation or treatment. Dr Srilal Mudunkothge is an experienced Ayurvedic practitioner who has worked at Ulpotha since 2004. 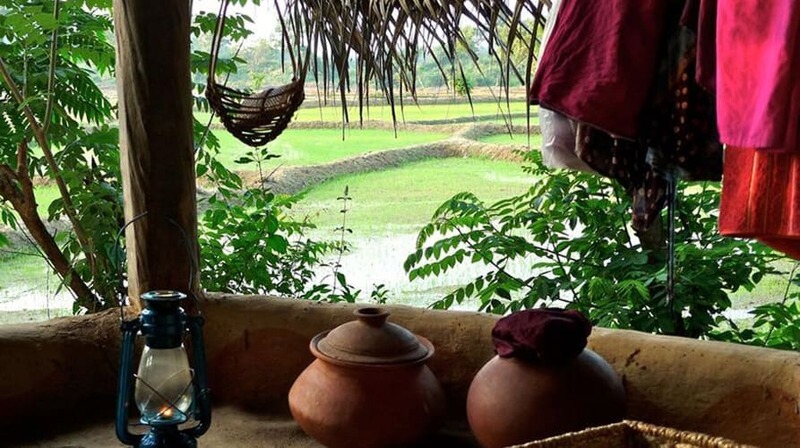 I sat in his ‘office’, a small, dark mud hut as he asked me questions about my health and lifestyle to establish my doshas and prescribed a massage. For two hours I was rubbed with a paste of tumeric – known for its antiseptic properties, gooseberry and honey (to draw out toxins), steamed in a giant basket then scrubbed in the shower with mung beans! I emerged supremely relaxed. Some guests opted for a more intense programme of treatments – up to two weeks – but I didn’t feel the need. 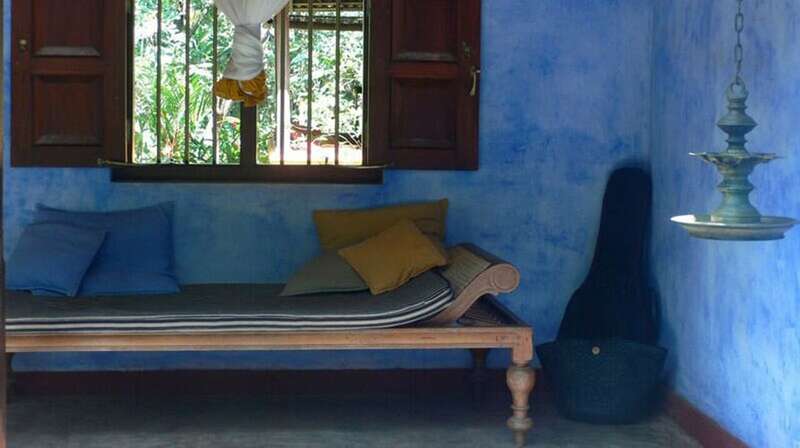 And the doctor reassured me that just being at Upotha is Ayurvedic; the organic food, the yoga, the lack of technology, being surrounded by nature – all of these factors help rebalance guests. Indeed, when a typical day starts with yoga, includes several naps, a gentle swim, Thai chi, delicious food, early nights and the option of more massages from two guest therapists, every day life with its pressures and annoyances soon seems a very distant place. Ulpotha has a rota of experienced teachers offering various types of yoga but my stay coincided with my Gingi Lee, an Ashtanga teacher from south London. Ashtanga is faster paced and more dynamic than other forms of yoga but the classes were led (as opposed to Mysore-style self-practise) so those who hadn’t done it before had no problem in following the postures and there was a very relaxed, friendly atmosphere in class. In the evenings Gingi led the group through a gentler routine, often incorporating Thai Chi or mindfulness. These sessions were held at the lake or on the rocks above the retreat as the sun set, and the serenity of the scene, coupled with the languid movements usually left me wanting to curl up and sleep on the spot. Fortunately I always managed to rally myself for dinner – a treat not to be missed. The food at Ulpotha is vegan and almost all organic: fantastic curries, red rice grown on site, sambol and fresh juices – all prepared without fridges and cooked over fires. And I must have drunk more coconut water that week than I have in a lifetime – the thwack of coconuts being opened is one of the sounds I most associate with Ulpotha. 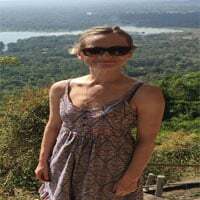 For me, one of the best things about going on a yoga retreat is the luxury of catching up on sleep – and Ulpotha encourages that more than most places thanks to its remoteness. A night in its treehouse is a chance to be even further removed. Once you’ve climbed up the ladder to the little hut it’s just you, and the breeze in the trees. In the morning you can enjoy the stillness and a beautiful view of the lake, unless, you decide to leave some fruit out (as one guest did), in which case you’ll have visitors, lots of them, as ‘word’ spreads among the monkeys that breakfast is up for grabs in the treehouse.